Paradise Pictures offers you a full lifetime comprehensive guarantee for satisfaction and any type of damage to the portrait, including vandalism and cemetery maintenance errors. We believe that you shouldn't have to worry about the quality and durability of our products - that's our responsibility. Our portraits are guaranteed for the life of the memorial to which they are attached. 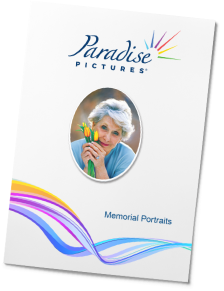 If you ever have a problem with your memorial portrait, including vandalism or other cemetery damage, Paradise Pictures will make a replacement portrait free of charge. 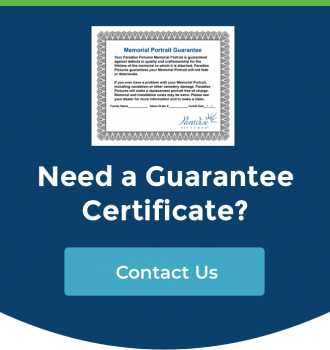 We have made it easy for our dealers to reorder under the guarantee. All images are archived by family name, sales order number and original order date in the event a replacement is ever needed. This unconditional policy supports our belief that you should not worry about the quality and durability of our products – that's our job! Did you order from a competitor and now it needs to be replaced? If you have to replace a competitor's product that has failed in the cemetery, you have a partner in helping you get it done. We will provided a $50 discount off of a color replacement and a $15 discount off of a black and white replacement. We will also need the family's chosen photograph and better yet, it doesn't even have to be the same image. This also qualifies you to include an AdmiredLife Online Memorial at the same time.